I don't usually either, but I don't like to see people ruin the riding characteristics of their motorcycle just for looks. At the end of the day a motorcycle that doesn't deliver a good riding experience is useless. The GSXR fork swap started with the SOHC cb750 crowd and was popular because it was a modern USD fork that didn't change the stock front end geometry. People put them on mostly for looks but the benefits are better brakes, better damping, better access to modern tires which are all real benefits the GL1000 could really use. On a SOHC honda I think the fork is kind of overkill in the sense that it is a bigger lever in the front to impart forces to the neck when leaned over, but for a much heavier GL1000 it's probably fine. changing the piston size on a master cylinder is not as simple as bigger means more fluid and better breaking. It is also about lever feel. I have ridden many bikes with in appropriate masters where the lever was completely wooden or completely soft and the brakes operated like an on off switch. It is actually counter intuitive but a bigger master cylinder piston means less hydraulic advantage and therefore less actual force imparted to the brakes. People like this because it creates more "feel" in the brakes, even though you are actually squeezing harder it is over a smaller distance. A smaller piston increases mechanical advantage which means less force is needed to squeeze the levers but it is over a greater travel distance and can have a vague feeling. If your brakes feel wooden you go smaller because the master piston is too big, if your brakes feel spongy you go bigger to get some feel back. This is provided it is within the limits of what your caliper pistons need - too big and you also won't stop at all, too small and you are pushing seals and causing brackets to flex. There are lots of way to "tune" your braking system you probably haven't thought of. This is why dog leg levers were so popular in the 1980's because they added leverage. By the way, since your name is "prop Aviator" what do you fly? Last edited by Geeto67; 11-17-2016 at 09:26 AM. Upsizing the master cylinder does not equal more bite. Yes, it will move more fluid, but you have to put more force at the lever to get the same line pressure. There are several things that are factors in lever feel and braking force. Namely the location of the pivot, master cyll diameter and caliper sizing. There are some formulas to figure it all out, but the best (easiest) method is to use the master that matches the calipers. Attached is a pic that explains why just putting a larger master cylinder results in a wooden feel at the lever. The blocks on top represent a 20 lb weight which is the force exerted on the master cylinder at the lever. 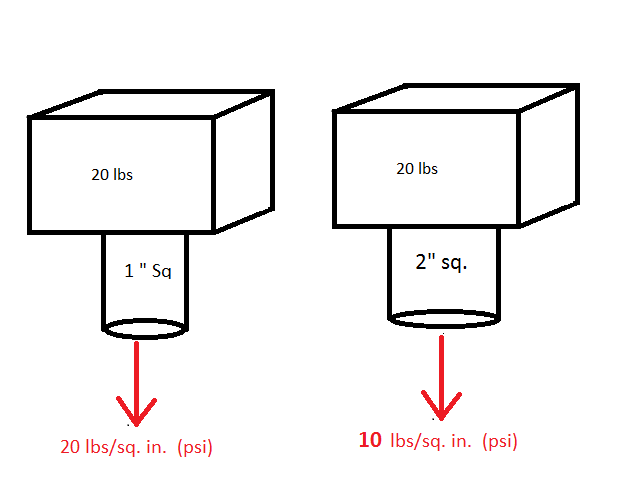 On the left is a cylinder that has a diameter that has 1 square inch cross sectional area (using round numbers for illustration purposes). On the right the cylinder has been up-sized to have a 2 square inch cross section. The red arrows depict the force exerted in the brake lines. Notice that with the same force applied to the lever, line pressure is halved. Better bite, or better braking comes from more surface area at the calipers, but then you need a larger MC to move more fluid. The additional effort given by larger calipers offsets the loss of feel at the lever. It is all give and take. I understand braking systems very well, thanks. All I'm saying is that there are a number of ways to skin a cat. I'm going to leave the braking system stock for the time being. Sure, it won't stop like a new KTM 1290, but with rebuilt calipers, a rebuilt master, and new brake lines, it should be adequate. Like I've said before, it's going to be some time before I really start leaning on the bike hard. I haven't flown in some time. Life kinda got in the way with college, then work, bills, etc. I used to fly C150/172s regularly, but I also have some DC3 and B25J time in my logbook. I used to work in the restoration shop of the Carolinas Avaition Museum when I was younger and got hooked up with a couple travelling airshow acts. Good times. The harder swap for you isn't going to be the front, it will be the rear wheel. you'll want an 18" rear rim on the back, unless to do the gsxr swap then you may want to keep your 17" rear so you can get matching rubber. If you can find a set of lester wheels for a GL1000 with 18" rear and 19" front I highly recommend swapping to those. The 1977-78 comstars aren't the greatest wheels on the planet, they are prone to corrosion where the spoke meets the rim and can weaken over time. I believe you can swap out any front comstar with later reverse comstars of the same size but I don't know about the rears on GL's. EDIT: Looking at that made me think, you could do a CX500 Deluxe wheel to get an 18" Comstar, or alternately, a set of CX500 Turbo gold boomerangs would be very cool. 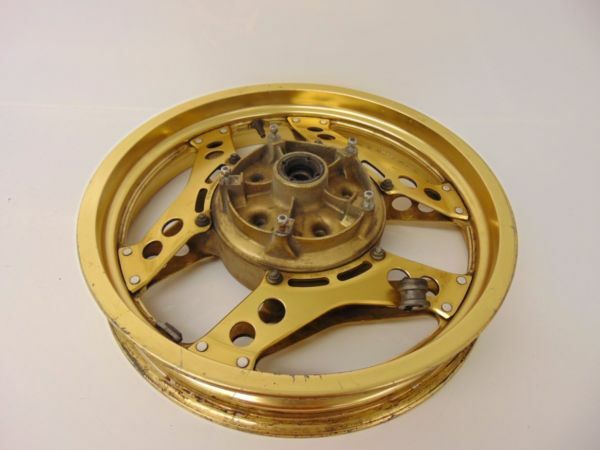 I did a little digging with online parts listings, and it appears that the '75-'76 GL1000 wire spoke rear wheel is, indeed, interchangeable with your Comstar. You could pick one of those up and give a call to Buchanan's Spoke & Rim. They should be able to fix you up with an 18" hoop no problem. This all assumes that there's no swingarm issues with a larger wheel, of course. Surprised at the attention this is getting. Anywho. I had a gl1000. The right side cam gear snapped off of the cam at 90mph one day. That was rather interesting. I preferred the ergos of the gl1000 over most other wings, my gl1500 was definitely not made for tall people. Doesnt seem like hes here for advice. Theres nothing wrong with that. Play nice y'all. There's plenty of other threads you can junk up with arguments and BS, let's not make this one of them. Wtf are you talking about. I shared my experience with a bike. Do you need a safe space? Sorry I forgot to wear my safety pin today. Last edited by DohcBikes; 11-17-2016 at 04:29 PM.